Drumroll please… we’re thrilled to announce that handbags are finally here! Our team has been working long and hard over the past few months to be able to offer you the very best of like-new designer bags. Starting today, you can shop on trend clutches, hobos, crossbodies, satchels and more on thredup.com/handbags — at up to 70 percent off retail! Our collection of nearly two thousand pieces includes brands like Kate Spade, Cole Haan, Marc by Marc Jacobs and Michael Kors, in addition to bags from coveted fashion labels like Prada, Alexander Wang, Chloe, Hermès and Louis Vuitton. And don’t forget that you get a $10 credit when you refer a friend and they make their first purchase. To celebrate, we’re also offering you a chance to win a designer bag of your choice! To enter, show us what’s in YOUR bag. We want to see what must-haves you carry with you — enter by taking a photo with the hashtag #whatsinmybag like the example below. 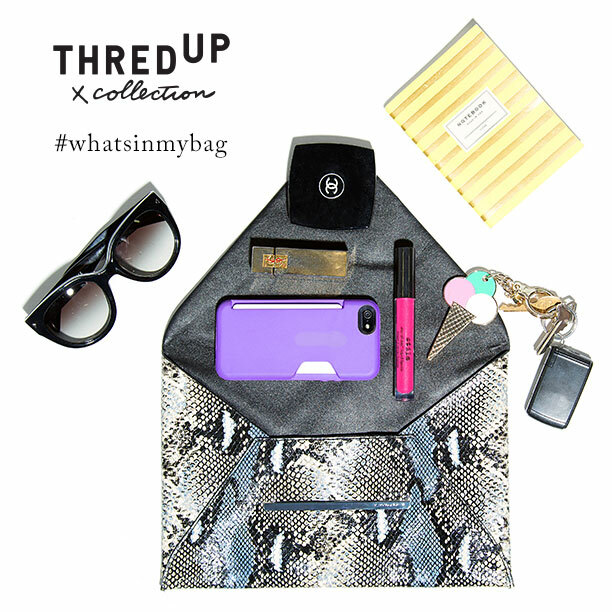 Share the photo on Facebook, Instagram, Twitter, Pinterest or Google+ with the hashtag #whatsinmybag and tag @thredup. We will randomly select a winner this Friday May 9th! What are your handbag essentials? Let us know in the comments below!